En plein air | One quality, the finest. Last weekend, the nation’s oldest art show took place in Rittenhouse Square, Philadelphia. This twice-a-year event started in 1932 and we always enjoy strolling around the over 100 booths of fine art. 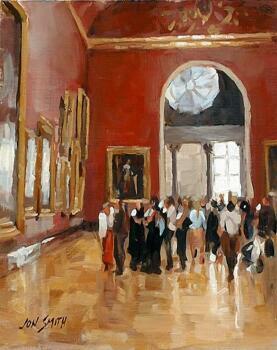 We discovered a new exhibitor, Jon Smith, from Florida. 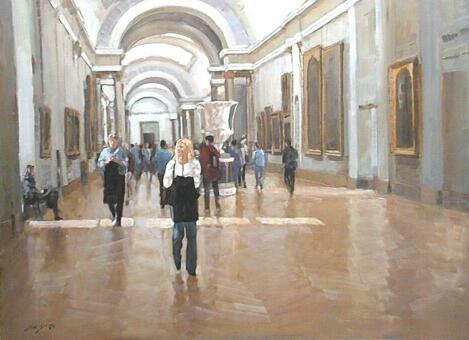 Many of his highly original paintings feature people in museums admiring world famous pieces of art. Smith studied for a year in the south of France at The Marschutz School. Like many before him, he was inspired by the light of Provence and the Impressionists. In moving from painting en plein air (ehn plen air), or outdoors, to his paintings of interiors, Smith carried his sense of light with him. Several of Smith’s canvases in the Philadelphia show featured the Louvre or the d’Orsay museums. The works of art in the museum are portrayed with such meticulous detail that a Smith painting is like owning more than one painting at the same time. The paintings create a sort of multi-layered dialogue between the original work of art, the person in the painting observing it, and the flesh-and-blood person appreciating Smith’s canvas. His paintings remind me of a more intimate version of Samuel Morse’s “The Gallery of the Louvre.” The award-winning Smith will also accept commissions. Think what a great gift it would be to give a painting of someone admiring a favorite work of art in a favorite museum. I can’t decide if I’d get painted in front of “La Liseuse” by Fragonard or any number of wonderful paintings by Élisabeth-Louise Vigée Le Brun. Maybe I’ll take one of each. This entry was posted in Art and tagged en plein air, Impressionism, Jon Smith Art, Rick Steves’ Provence and the French Riviera, The Marschutz School. Bookmark the permalink.